Experts inspect the damaged Notre Dame cathedral after the fire in Paris, April 16, 2019, assessing the blackened shell of Paris' iconic cathedral to establish next steps to save what remains after a devastating fire destroyed much of the almost 900-year-old building. As crews check the structural stability of France's Notre Dame Cathedral and work to determine the full extent of damage from a massive fire at the centuries-old Paris landmark, President Emmanuel Macron is pushing ahead with an ambitious goal of rebuilding it within five years. 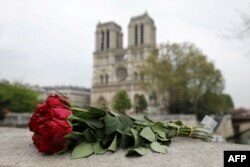 Macron gave the proposal to rebuild it "even more beautifully" in a nationwide address Tuesday night, and planned to spend Wednesday meeting with his Cabinet to discuss the reconstruction and funding that will be necessary to rebuild. He already has a huge head start, with wealthy French citizens and businesses having already pledged about $800 million. 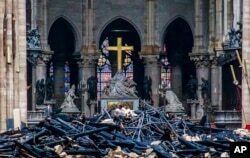 Prime Minister Edouard Philippe announced a global competition Wednesday to rebuild the cathedral's spire, which was destroyed when the iconic structure's roof collapsed. He said architects from around the world would be invited to submit designs for a "new spire that is adapted to the techniques and the challenges of our era." But those in charge of carrying out restoration efforts at other historic cathedrals cautioned it could take decades to complete the work. Cathedral rector Bishop Patrick Chauvet told local business owners Wednesday the famed monument would be closed for "five to six years." He said, "A segment of the cathedral has been very weakened" by the blaze, but did not specify which section. Chauvet also said it was not clear what lies ahead for the church's 67 employees. United States President Donald Trump said via Twitter Wednesday he offered condolences to Pope Francis on behalf of U.S. citizens and offered the expertise of U.S. experts to help with the renovation of the Gothic cathedral. While Notre Dame's spire and roof collapsed, the cathedral's walls, iconic bell towers and round stained glass windows survived. A woman places a candle with others at the Place Saint-Michel the day after Notre-Dame Cathedral suffered heavy damage from a massive fire that devastated large parts of the gothic structure in Paris, France, April 16, 2019. Also surviving are the Crown of Thorns, the site's most sacred relic that was purported to have been worn by Jesus Christ during his crucifixion, as well as a 13th century tunic said to have been worn by French King Louis IX. The exact extent of the damage will not be known until the remaining structure is deemed safe enough for teams to go inside and access all areas of the site. The Paris public prosecutor is investigating the cause of the fire, which is suspected to be linked to renovation work on the cathedral's roof, and said it would be a "long and complex case." Authorities are interviewing dozens of people from five companies that were involved in the renovation work. A spokesman for one of the companies, Julien le Bras, said, "All the security measures were respected" by its 12 workers whom he said are "participating in the investigation with no hesitation." The fire broke out during the holiest week of the year for Christians. 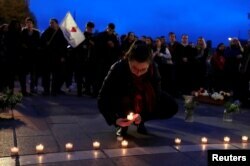 It occurred less than a week before Easter and during Holy Week commemorations. An Easter Mass had been planned at the cathedral on Sunday. A Vatican statement expressing shock and sadness called Notre Dame a "symbol of Christianity in France and in the world." Vatican spokesman Alessandro Gisotti said Tuesday on Twitter that Pope Francis is praying "for those who are trying to cope with this dramatic situation."